Before I got to Mittry Lake I called the same dentist (Dr Eva Urena) to get an appointment. They weren’t able to fit me in for at least a week. Then I mentioned that my friends also had appointments with her so they told me I could come in the same time as their appointments and they would fit me in. How accommodating!!! So early Thursday morning (8am) Debbie, Gayle and I headed to the dentist. Here I am waiting for my appointment. Do you think the cross has any significance? They cleaned my teeth (only $35) and checked out a couple of problem teeth. One was a wisdom tooth that I still have and she said they would pull that ($80). The second problem was more severe. I have 2 old crowns that need to be removed ($30) and a tooth between them that also needs to be removed ($70). Then I have to wait 3 weeks to heal and I will then be fitted with a 3 unit permanent bridge ($660). YUK!!! Fortunately I have the time so I set up an appointment for Tuesday to have the teeth removed. After Dr Urena told me what had to be done and gave me the estimated cost I told Gayle the bad news. She mentioned that maybe I might want to get a second opinion. I got the name of another dentist that others had recommended and called them. I let them know that the tooth was really bothering me and I needed to see the dentist ASAP. Even though I didn’t have an appointment and I had never seen the dentist before they told me to come right over. Within a 1/2 hour I got an opinion from 2 dentists that were working in this office. They also said I would have to have 2 new crowns ($700) and possibly a root canal as well ($350) depending on what they found after removing the crowns. I decided to go with the first dentist as it seemed like a more permanent fix and less costly as well. She came highly recommended and I have confidence that she is a good dentist. As I was leaving the second dentist office, I ran into Chris who was also getting dental work done. What a coincidence. 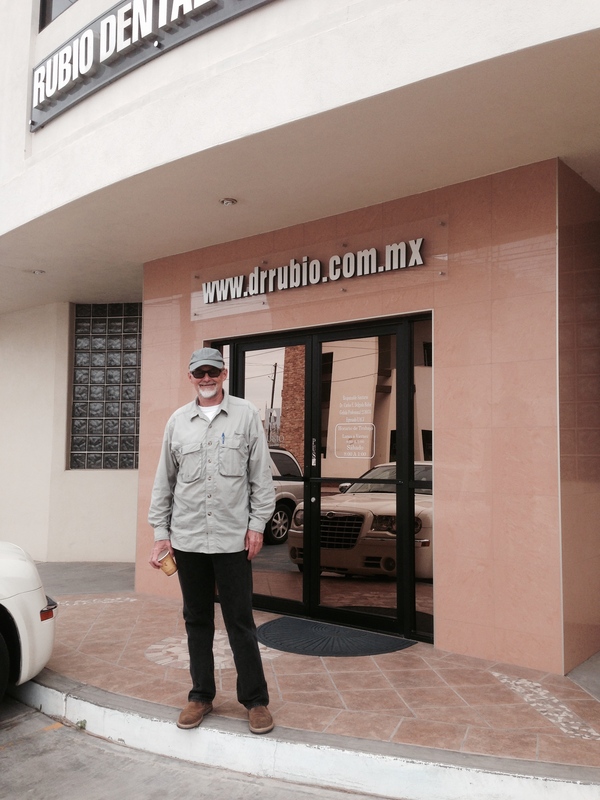 I was surprised how easy it is to get an dental appointment in Algadones. Just tell them you are in pain. HA! Chris and I both went back to the first dentist office where Debbie and Gayle were still waiting. 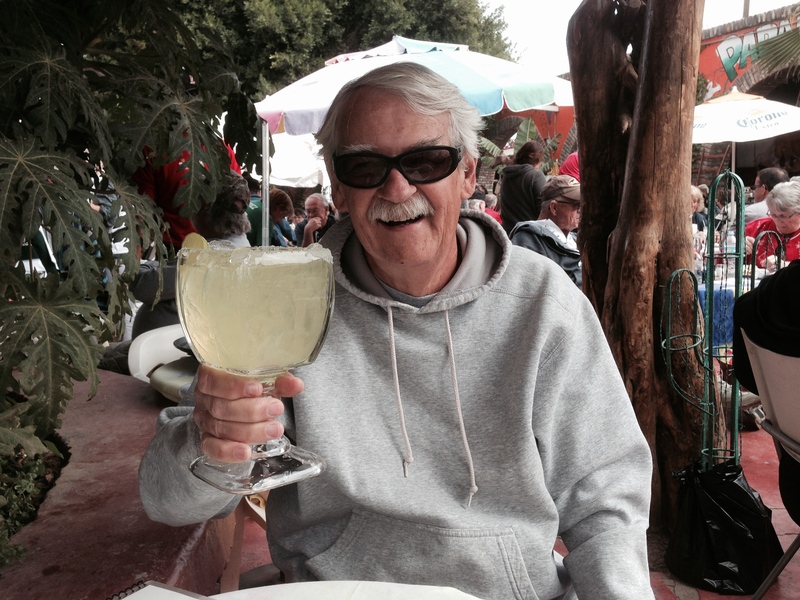 It was almost an hour until Gayle’s appointment so Chris and I headed downtown to check out a cantina. We found a table and I ordered a margarita and Chris got a diet coke. My margarita was huge. Then Debbie and Gayle caught up with us and we went back across the border. I remember going to Algadones in 2012 and it took over an hour to go back across the border. This time we walked right thru without a wait. I only had my phone which does not take great pics. On top of that I got my finger in the top right corner. DUH! I wasn’t planning on spending so much for dental work, but had I gone to a dentist in the states it probably would have cost me a fortune. Now I have another appointment for Tuesday morning, which I am not looking forward to. But it will be nice when it is all done. 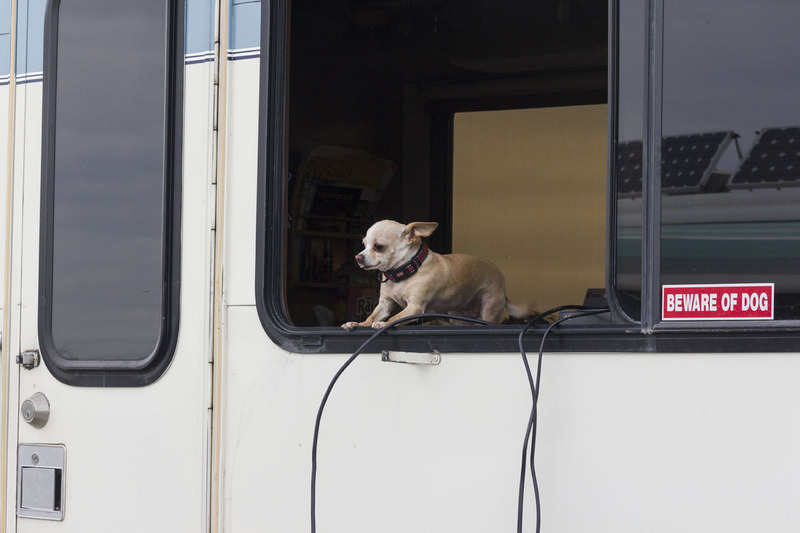 Mary Gardner who also has a great website sent me this pic of Chica while we were in Quartzsite. 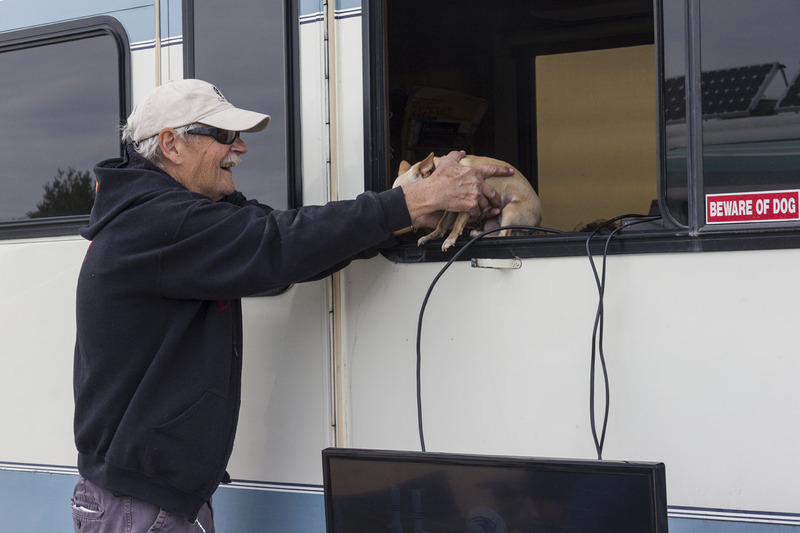 It was taken while we were watching the football game on the TV set up outside my rig. Chica just had to come out and join us. 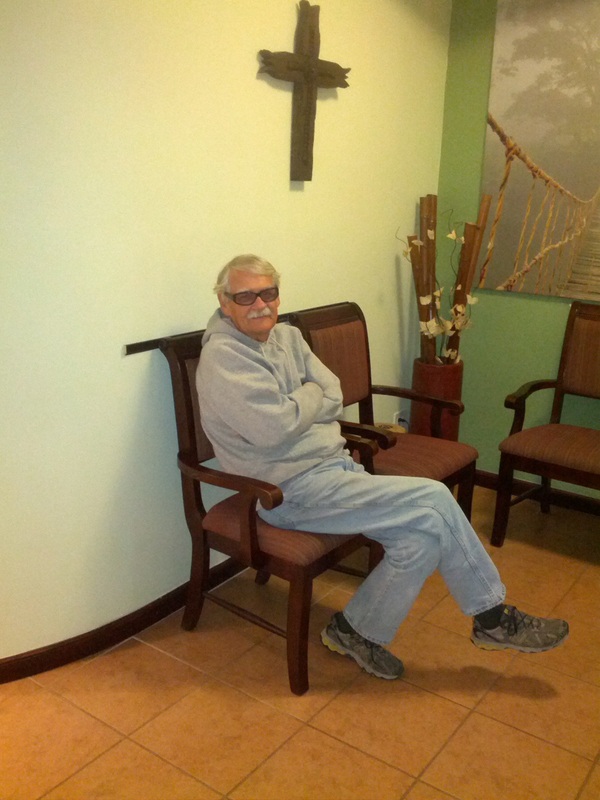 This entry was posted in Algadones, Chica, Dentist, Friends and tagged Algadones, Chica, Dentist, Friends by Jim Melvin. Bookmark the permalink. That’s a great price for a cleaning. Wish I had gone with you. When it’s all done and over with you will be so glad you had it done. And so much cheaper than in the USA. I love the Beware of Dog. So vicious. And so cute. Thanks for sharing the info on the Dentists. Although we’re ok right now, you just never know and it’s nice to hear about a positive experience. Chica is sooooo tiny! Like a little toy! You two are a match made in heaven!!! The dentist info is much appreciated. Chica steals the show every time. Sorry about the link to Mary’s blog. I have fixed it. Your dentist-by-dentist narrative kept us in suspense, Jim. Will he get it done? Maybe #2 dentist? 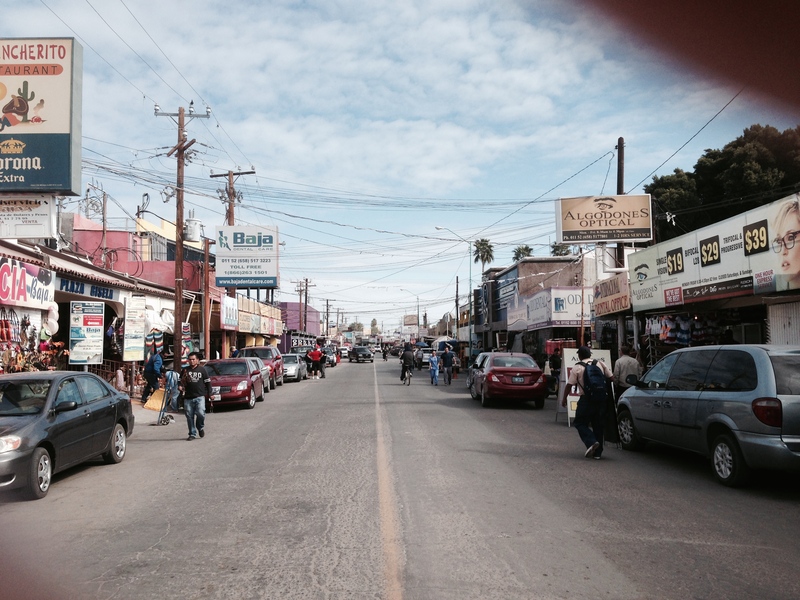 hope visit Algodones for first time. You ever consider attending a LD Caravan Gather ing. Next one is Stagecoach RV, about 130 miles nw Yuma. and a great group of LDers. Come along and see for yourself, Jim.